Chris Petersen is still trying hard to explain why he benched Jake Browning in favor of an inexperienced freshman. Meanwhile, 4 years of trust between player and coach is threatened. On the Monday after Jake-gate, Chris Petersen went through a predictable effort of defending his decision to switch quarterbacks mid-game Saturday in a contest Washington led. The Huskies coach said bailing on Jake Browning for two series against Cal wasn’t about him as much as the bad offense as a whole. He said backup Jake Haener, a redshirt freshman, has done well in practice. He said he’s changed players at all positions over the course of the season. All these things are partly true, but that’s his thin cover story for public consumption, and he’s sticking to it. And Browning. All well and good. But what Petersen fails to acknowledge (or understand?) in his labored justification for the controversial decision is that what he did in Berkeley likely feels to Browning like a betrayal by a good friend. It’s not exactly like that, because the relationship primarily is mentor-pupil. But anyone who has been in an intense, mostly successful mentor-pupil relationship knows that there lurks in the layers a trust relationship that makes the downs as endurable as the ups are enjoyable. If that relationship existed, and whether it was merely nicked or seriously damaged, in the wake of a ghastly 12-10 loss to a modest Cal team, can’t be known. The principals, being highly competitive guys, are too stubborn and proud to admit to any of it. Besides, neither QB has been allowed to talk to the media in the cloistered world of Huskies football. But anyone familiar with human nature can reasonably suggest that the consequence for Browning goes beyond the understandable anger that was acknowledged by Petersen. True. Yet anyone knowing Browning knows he would never let down his teammates. He will be fully engaged at 6 p.m. Saturday when the now-unranked Huskies (6-3, 4-2) host now-unranked Stanford (5-3, 3-2) in the vast wasteland that is the Pac-12 North. Remarkably, the Huskies can still reach the conference title game if they win out against the Cardinal, Oregon State (2-6, 1-4) and Washington State (7-1, 4-1). But Saturday may feel different for Browning. He figures to have a hard time trusting Petersen anymore. For four years, they have been a tandem helping lead Washington to national eminence as a re-emerging power in college football. Publicly, they have had each other’s backs through all the second-guessing, questions and controversies that are inevitable. But now, to Browning, it may look as if Petersen, no matter his strident claims to the contrary, has joined his critics. They say Browning peaked during his sophomore year when he was Pac-12 offensive player of the year and the Huskies reached the College Football Playoffs. They say he has plateaued or even regressed, misreading defenses and making dubious pass/run judgments. In a purple world of suddenly high expectations, there is little tolerance for error, or acknowledgement that missing injured LT Trey Adams, RB Myles Gaskin, TE Hunter Bryant and WRs Chico McClatcher and Quentin Pounds has diminished the offense. Petersen’s decision to pull Browning with 1:56 left in the third quarter for the inexperienced Haener was an action that spoke louder than Petersen’s words of support, and louder that the critics’ catcalls for change. After all that Browning and Petersen had been through, the coach didn’t trust the player to pull the Huskies through a game they were leading, albeit 7-6. Asked why, amid the substandard play of others, Browning was singled out, Petersen said, “Because everybody else had already been taken out before. We rotated receivers, backs, line — and it’s just about doing something. But what Petersen tried to do, failed abjectly, making matters far worse. After a no-chance incompletion, the inexperienced Haener threw an interception to Cal LB Evan Weaver, who returned it 37 yards for a touchdown, Cal’s only TD. The QB switch turned into the worst decision since adobe diapers. Haener was given one more series that produced a first down and a punt. Browning finished out, getting the Huskies to a first-and-goal at the Cal 9-yard line. After a no-gain run and an incompletion, Browning’s third-down play was him at his worst — pedaling straight back from a heavy rush and throwing off his back foot, he lofted a floater to the goal line that appeared to be intercepted but was ruled a drop by the defender. The subsequent field goal was made irrelevant when the Bears ran out the clock against a tiring but valiant UW defense. The upshot was the 11-point favorite Huskies lost, leaving two dispirited quarterbacks and a bewildered fan base that was already puzzled by the Oregon loss when Petersen passed on a chance to get closer for a last-second field goal, a potential game-winner that barely missed right. Petersen Monday was given a couple of chances to justify the use of Haener, who had seen only mop-up duty earlier in the season in a blowout over North Dakota. He said Haener’s skills were “different” but never explained what that meant, nor why he thought it would work for the first time in a high-pressure situation on the road. Sounds like a guy trying too hard to justify the unjustifiable. Might be easier to own up and move on, as he did with the field-goal attempt at Oregon, when he said if granted a do-over, he would do it . . . well, differently. Unless, of course, Jake-gate was all about some sort of punishment over Browning disregarding the game plan, or talking back, or otherwise being disruptive. But without some clarity/transparency, we’re left to guess. Petersen probably has never been more eager for another game to get here. Guess he’ll have to trust Browning on that. OK…1) If Haener had led a TD drive, Petersen would be a genius, just like in Alabama’s championship game last year. But, in the immortal words of Cosmo Kramer, “Well, that didn’t work.” 2) In light of recent weeks, has Oregon State moved up to Division III? 3) It’s a stretch to say that Jake “got them to first and goal.” They got in position via a good punt return. And why UW ran two sweeps, rather than pounding the ball towards the goal line from the nine– before another ill fated Browning Monty Python full retreat (run away! run away!) and his mind blowing heave into oblivion (how many times has he done that? )– is beyond me. It reminded me of a certain never-to-be mentioned call on the doorstep against another team in blue. Actually, it’s not a stretch at all to say that Browning got them to first and goal. Ahmed lost 10 yards on a reverse on first down from the 22. On second and 20, Browning completed a 23 yard pass to Ty Jones to get them a first down…at the 9. In the Book of Football, that’s known as first and goal. Look, there’s plenty of criticism to be thrown around, and even if Haener had led them to a touchdown I would still call the decision a bad one based on the information available at the time—on the road, backed up in their own territory, leading 7-6, and replacing a four year starter with a player whose only “meaningful” time prior to that was at home in mop up duty against North Dakota’s backups. That’s going to go wrong far more often than it goes right. But critiques oughtta be based on facts. Those still matter, don’t they? In the previous answer to husky73, I think the sequence is corrected. You’re right that even had Haener directed a score, the logic to switch QBs at that juncture doesn’t stand up. As i said above, if Haener had led a TD drive, then what next week? Oregon State is D-III, leaning to II. As I recall, Browning made a great throw to Ty Jones for the first down at the 9. Then a Pleasant run went nowhere, followed by an incompletion. No sweeps. The next play was the backpedal to a floater pass that became an interception/incompletion. The latter was indeed a repeat of a bad habit. It was inexcusable for Petersen to put in Haener when he did, in a total “save us” situation, with essentially no game experience (ND game does not count). Jake and Hamdan had a crap game up to that point, yes, BUT you don’t throw a kid to the wolves like CP did. James often played his backup each second quarter, when the opponents’ #1’s were in, to see how they performed and to develop real and valuable game experience, should the need arise. Let’s just say this season, given the number of starters who returned, has been a real disappointment, and look no further than WSU for a coach who does much with less. I think your Apple Cup spread went up four since you last wrote. I agree with you on the James strategy. Circumstances permitting, plan for a series or two for the backup that is shared with the starter. I don’t mean to be touchy feely or anything but my instinct tells me that the perfectly in control Chris Peterson is having some problems right now. His decision to pull Browning was shocking and not in line with what we’ve come to expect from this man. I agree with you Art that this will put a wedge in this relationship with Browning that might only be mended by a full mea culpa from CP perhaps in front of the whole team. I’m not sure that is in Chris’s wheel house and so far it doesn’t sound like he’s willing to even admit his own failure here. I don’t want to be over dramatic but it feels like Chris P is the one out of sync right now. Best of luck to him and the team. I don’t want to speculate beyond his actions. It’s just an odd scenario that can’t be supported by the words that follows his deed. That’s almost always the way to handle it. Accept responsibility, move ahead. Nixon should have tried that. Cal’s offense couldn’t do anything and the Husky D was being the Husky D. I think Petersen just wanted to send a message to Browning and the offense. On its face it was a low risk move to try and jolt a very flat team to life. However, part of keeping it low risk is not throwing the friggin’ ball. This just spectacularly blew up in their faces. I’m getting to the point where I actually feel bad for Browning. I can’t think of a college QB who has gone from program savior to goat like he has. Most grown men would be mentally challenged by this, much less a 22 year old. Another way to look at it: What happens if Haener leads a touchdown drive that clinches the outcome? Does he go back to a shaken Browning, knowing Haener isn’t ready to do it for a full game? My opinion is, if that had occurred. Browning would never see the light of day as the Dawgs starting QB again. Another thought is that if Jacob Eason would have been eligible this year, it would more than likely be. Browning who? Eason time next year. Jake Haener’s other scholarship offers: Akron, Eastern Wa, Florida Atlantic, Hawaii, Middle Tennessee St, Northern Arizona, Northern Colorado, Toledo. His visits without offers: Fresno St, Utah, Wazzu. Not sure what the under 6′ middle of the road guy was going to offer over the 4-year starter. I’m usually the first guy to call for the backup QB, and I’m no big Browning fan, but he probably deserved the chance to go down swinging in his senior year. 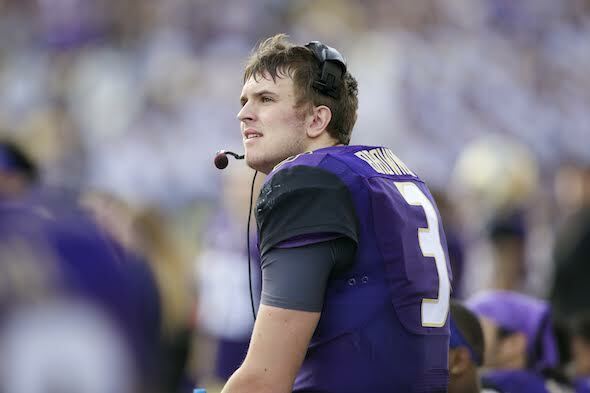 Can you imagine the state of the QB position next year if Jacob Eason didn’t transfer? I agree with those who feel like CP is the one who seems a bit over his head at the moment. Thanks for the recruiting info, although I typically put little stock in those comparatives. According to those who have watched him, Haener has been effective in practice. I think he might have done better had it been an injury replacement. But the whole team was stunned by the change, and I’d guess Haener was too. A poor calculation of consequences by Petersen. Not sure what the thesis is here. Is it that under no circumstances short of injury or a huge lead should Peterson pull Jake, because Jake would consider that a “betrayal”? Don’t buy that for a second. Or is it that the circumstances under which he did pull Jake were bad? I do buy that. It was not a good bet that Haener was ready for the position Peterson put him in–time, score, field position, etc. Generally speaking, though, Jake’s a big boy. If he plays poorly, repeating mistakes he’s had plenty of chances to correct, he SHOULD expect a hook….if there’s somebody behind him who is arguably ready for a shot. In fact, there’s a decent argument that he should have been pulled more often, from time to time, over the last couple of seasons–if only to season a back-up, and to send messages that there are certain things he simply should not do, and for which he will pay with loss of playing time. But that ship has long sailed. He’s got four games left, give or take. Once he’s gone, though, I hope Peterson adopts a different practice when it comes to QBs.